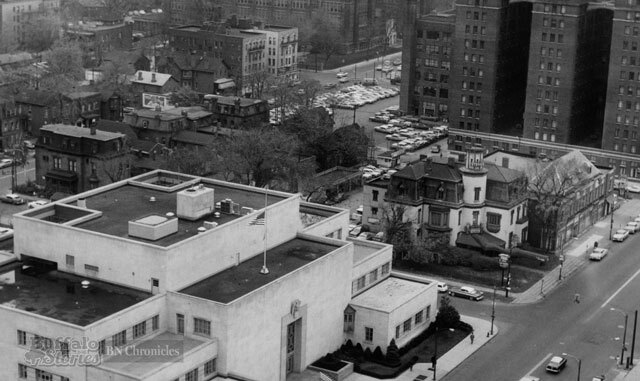 From the roof of AM&A’s in 1960, very few of the buildings seen here would still be standing a decade later. 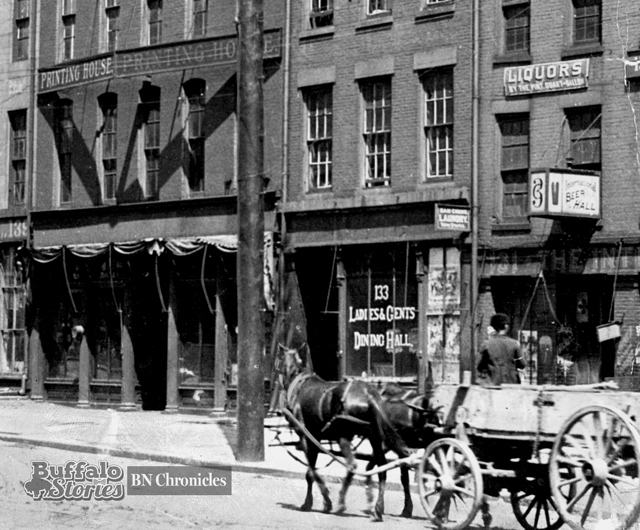 While the venerable Buffalo retailing names like Tanke and Ulbrich, which dated back to the 1850s and 1870s, would hold on until the 1980s, the buildings they’d called home for generations would not. 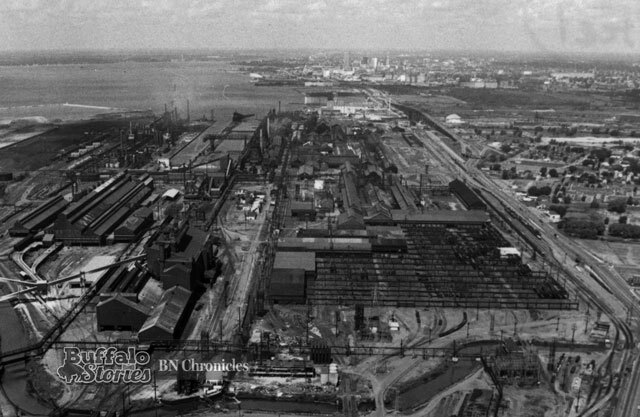 Most of the block was torn down to make way for the Main Place Mall. The buildings on the other side of Pearl Street the next block over would eventually be replaced by the Rath Building, the Family Court Building, and the Fernbach parking ramp. 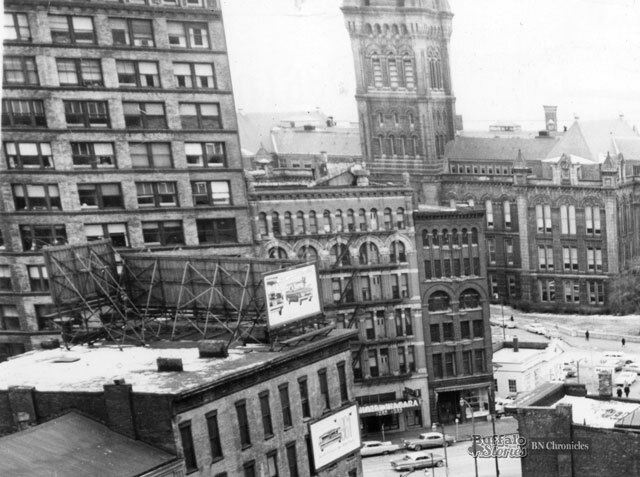 Among the buildings in the footprint where the Rath Building now stands was the Hotel Niagara. Through the ’40s and ’50s, the piano bar at Ryan’s Hotel Niagara was one of the Queen City’s most frequented and well-remembered gay night spots. One building still standing: Old County Hall, which was just County Hall then, but it was still almost 90 years old. 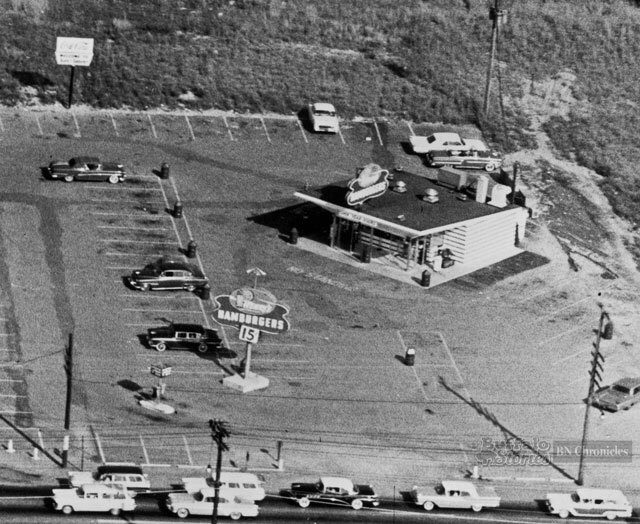 Back when living along the Tonawanda/Amherst border was like living in a real-life version of “American Graffiti,” Henry’s Hamburgers at Sheridan and Niagara Falls Boulevard was one of the many places a cruise down the strip could have landed. By the time the photo was snapped about a year into the operation of Henry’s in 1960, the Western New York version of guys like Ron Howard and Richard Dreyfuss and gals like Mackenzie Phillips and Cindy Williams had already eaten 720,000 hamburgers and 33 tons of French fries. The numbers were easy to hit when hamburgers were 15 cents each — or a bag of ten for a buck. 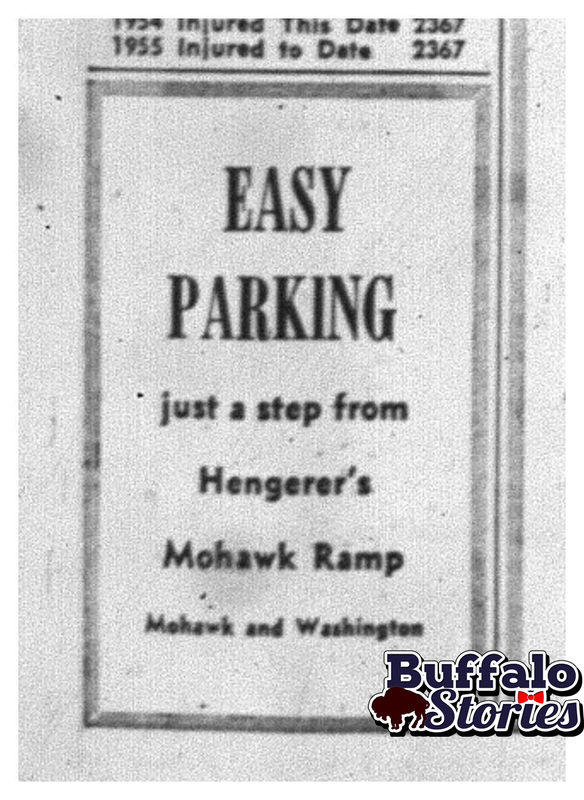 Within a year, there were three Henry’s locations — this one, another on McKinley Parkway in South Buffalo across the street from Park Edge (later Bells) Supermarket, and another across Union Road from Airport Plaza — right about where the Kensington Expressway eventually cut through. Through the ’60s and ’70s, at least a dozen different Henry’s locations came and went around Western New York — most notably, the two (one at Main and Dewey and one on Jefferson) owned by Bills great and Channel 2 sportscaster Ernie Warlick. The Main and Dewey location is the only one that survives as a restaurant. It’s now Tony’s Ranch House. As far as the Sheridan Drive location, the area has obviously lost the rural feel of this photo. The gas station selling 26¢ gas at its two pumps was soon replaced by a Firestone shop. The Henry’s lot has been filled in with a small strip plaza and a former Denny’s restaurant. 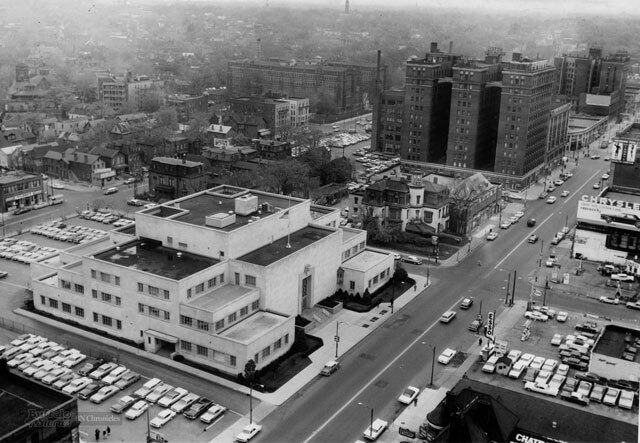 Shot in 1962, probably out a window in the Statler Hotel, this view of Delaware Avenue has evolved slowly but changed drastically through the last 54 years, essentially creating a new gateway to Buffalo’s City Hall and Niagara Square. The building we see the front and center still stands with some changes. It was built as the Federal Reserve Bank in 1955, and it remained so until it became the headquarters for New Era Cap in 2006. The most substantial change came in the years immediately after the photo was taken, when the block of 19th-century mansions was cleared for the building of what would become the Thaddeus Dulski Federal Building, now known as the Avant. The most remembered and revered building on that block was, in 1962, the Normandy Restaurant — one of Buffalo’s more swank dining spots. It was built by Dr. Walter Cary in 1851. Cary was one of Buffalo’s cultural elite, and for more than a century, his home was considered one of Buffalo’s finest. It was also the boyhood home of Dr. Cary’s son George, one of Buffalo’s leading architects at the turn of the century. He designed what is now the Buffalo History Museum for the Pan-Am Exposition, the Pierce-Arrow building on Elmwood and the gates and offices of Forest Lawn Cemetery, among others. 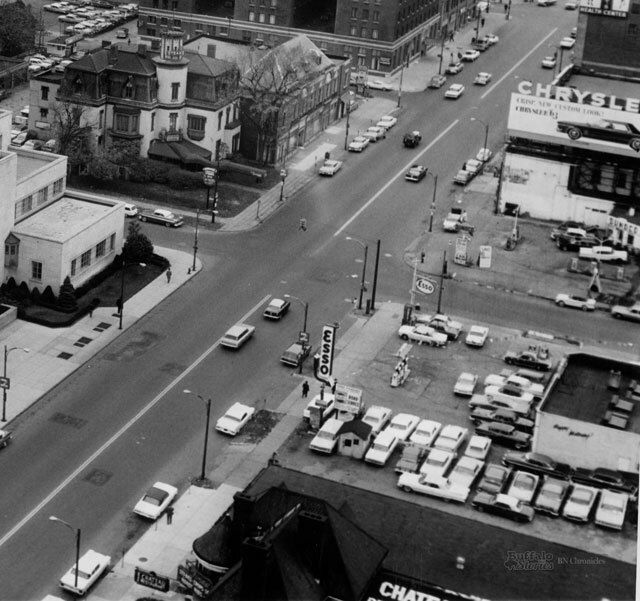 These few blocks saw many of Buffalo’s elite diners during this era. The Normandy is front and center, but across the street and out of view was Foster’s Supper Club. At the very bottom of the photo is the Chateau Restaurant, which lives on in the ghost sign still visible on the side of the only 19th-century home that still stands on that part of Delaware Avenue. The Chateau offered a “Choice of 25 entrees,” and it painted the offer on the building’s brick façade. The words “Choice of 25” are clearly legible today. Later, as the Roundtable Restaurant, the building at 153 Delaware Ave. served as the venue from which shipping magnate and restaurant co-owner George Steinbrenner announced that he was purchasing the New York Yankees. Toward the top of the photo, we see a corner that has undergone massive changes in the last 15 years. 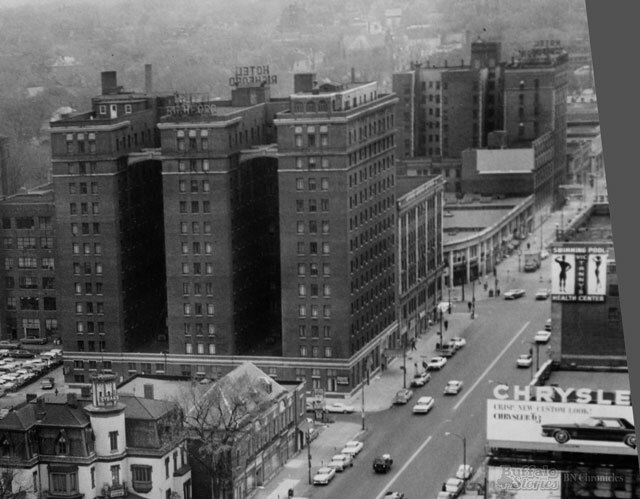 The Hotel Richford, previously known as the Hotel Ford, was torn down in 2000 to make way for the Hampton Inn & Suites on the corner of Delaware and Chippewa. Just past Chippewa is the Delaware Court Building, which was torn down in 2014 to make way for the 12-story headquarters of Delaware North. The northwest corner of Delaware and Chippewa was once the southeast corner of Dr. Ebenezer Johnson’s large estate. He was Buffalo’s first mayor in 1832, and his home, at the time, was on the rural outskirts of the city. 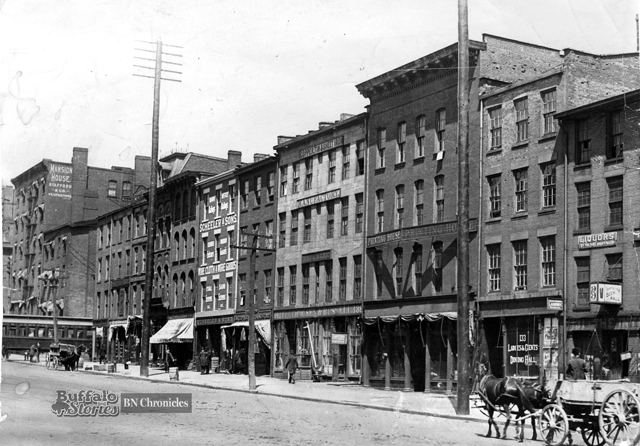 A home built by Philander Hodge on that corner in 1835, which later served as the home of the Buffalo Club, was torn down to make way for the Delaware Court Building in 1913. 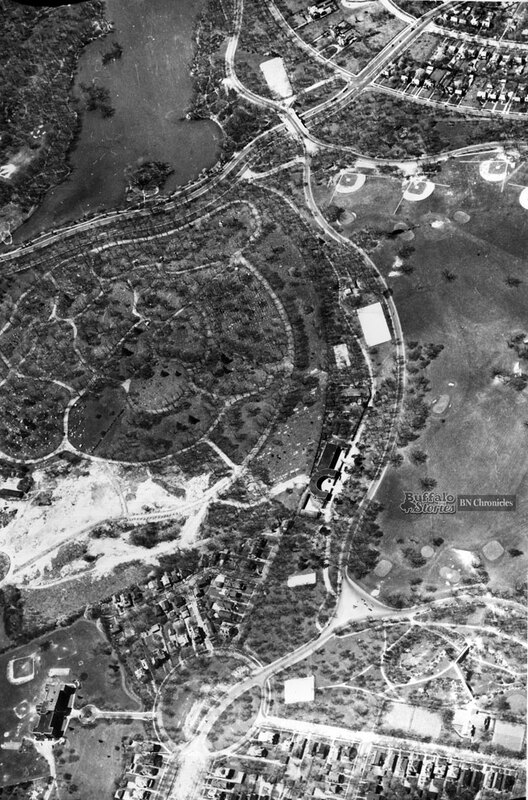 The address is still familiar 78 years later, but there’s not much from this December 1937 view of Lafayette Square that survives. The very top of the Soldiers and Sailors monument in the middle of the square is visible in the lower left corner. 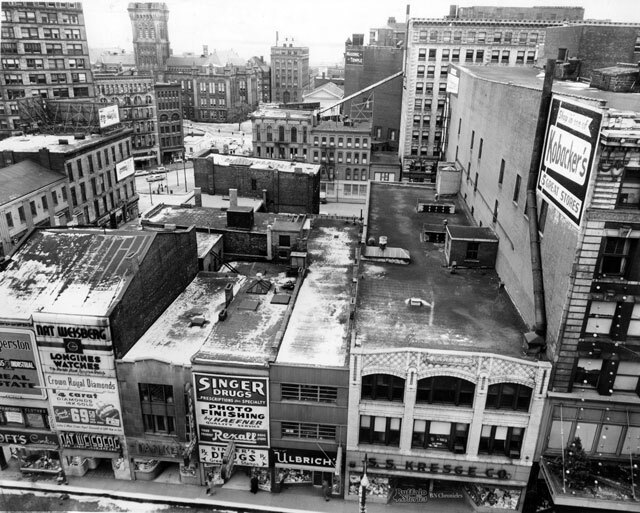 That, and the Hotel Lafayette — the Clinton Street wall of which is visible on the right side of the photo — are the only easily seen remaining structures in this photo. When the Romanesque-Revival old Central Library was opened in 1887, it was said that “no library in all the land is more nobly housed.” By the 1950s, however, the old building was seen as leaky, cold and difficult to adapt for new technology. The current Central Library replaced the 1887 building in 1964. Most, if not all, the buildings visible behind the library and Hotel Lafayette are gone. 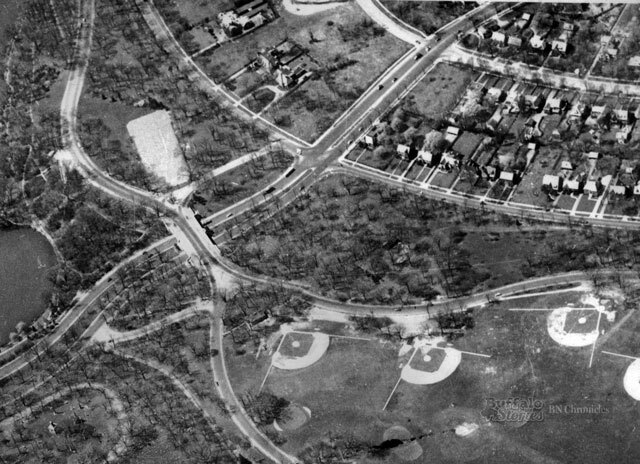 Most that survived into the ’60s and ’70s were torn down to make way for the never-built Elm-Oak corridor expressway. By the 1980s, modern bunker-like government buildings were built on the vacant blocks between Oak and Elm. The Lafayette Theatre building was torn down in 1972 to make way for a parking lot. The triangle in the background of the wider view photo, where Broadway and William come to a point, is now occupied by a gas station. 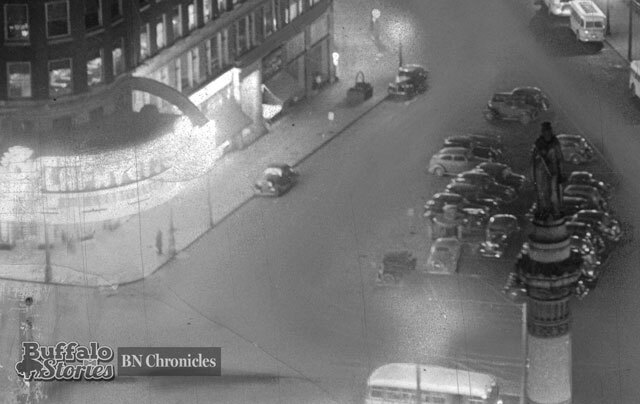 On Tuesdays, BN Chronicles will look at buildings or structures that are no longer standing, and look at what stands there now. 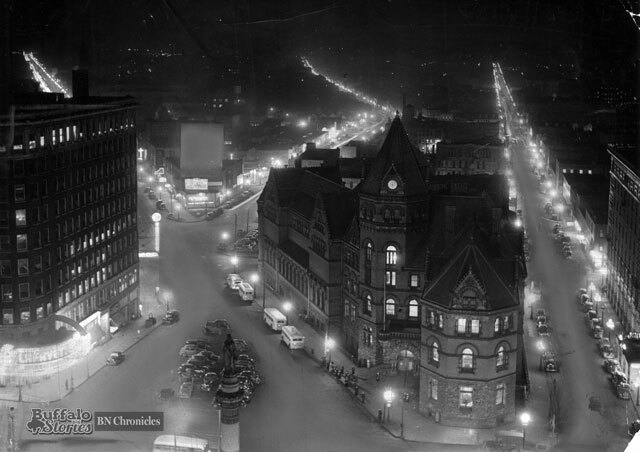 Hundreds of downtown Buffalo buildings were lost to the automobile, either with ways to move them more efficiently or to park them once they got there. 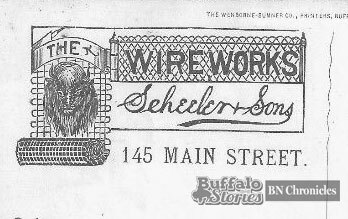 Images all appeared in The Buffalo Evening News in 1955. 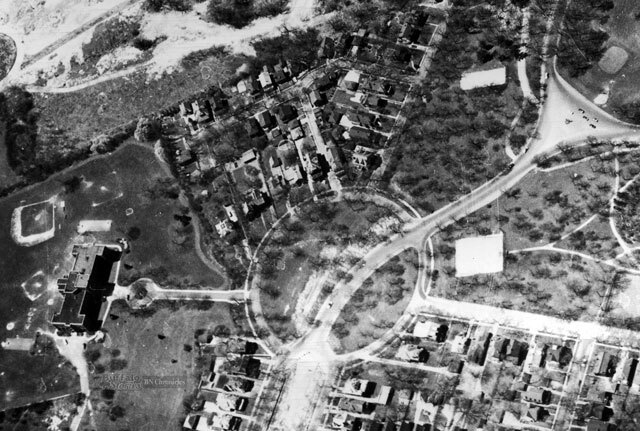 Highways like the Niagara Thruway and the Kensington Expressway caused the loss of some downtown structures, but the planned Elm-Oak elevated highway – which was never built – still precipitated the wholesale demolition of every block between Oak and Elm, between the 33 and the 190. 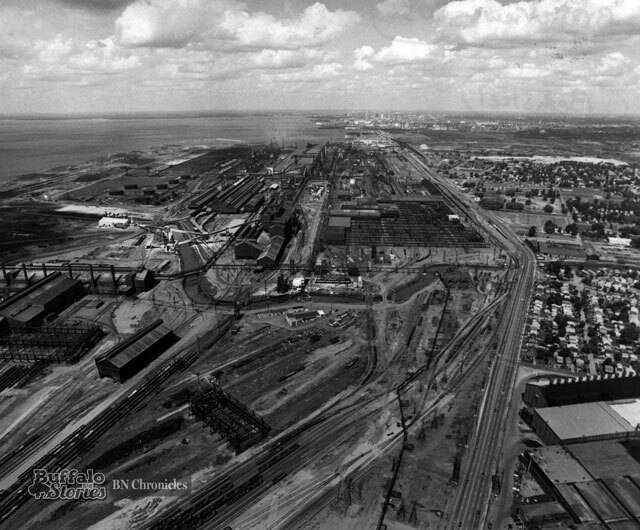 At the same time Buffalo thought these highways into the heart of the city would “save downtown,” something had to be done with the cars once they got there. Most look back with sadness or frustration at the fact that entire blocks were lost to civic parking ramps, and many other buildings were demolished to make way for private lots. 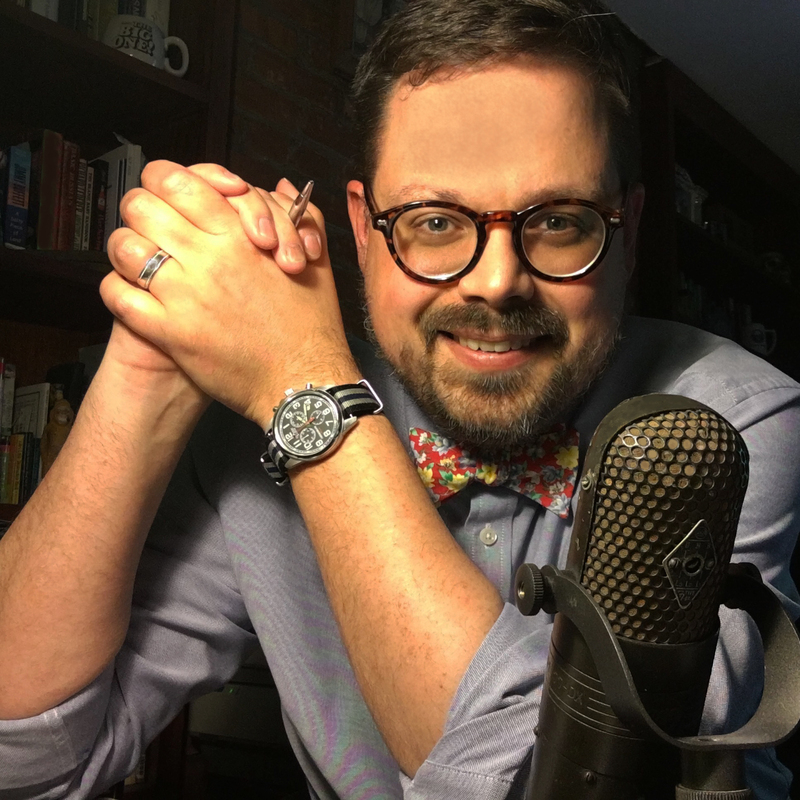 But as this was happening 60 years ago, the obviously good-intentioned hope was that given some place to park – perhaps the biggest beef about doing anything downtown at the time – that people would come. 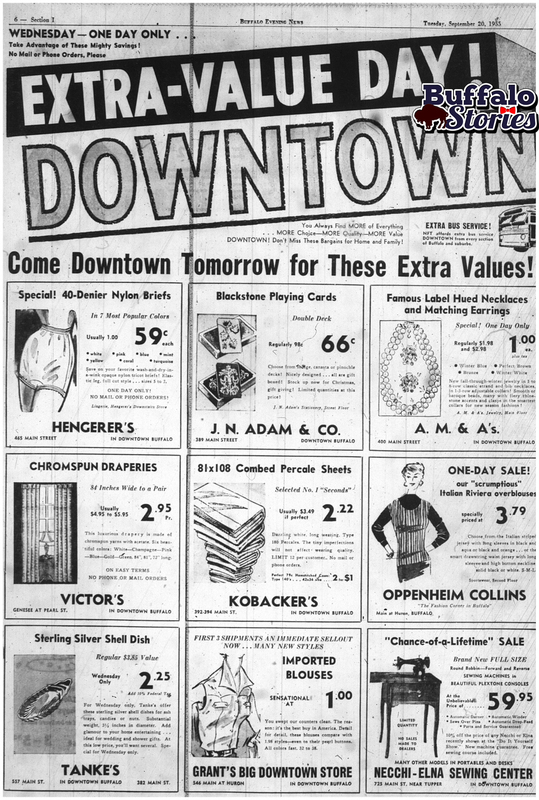 That hope can clearly be seen in the advertising of downtown department stores 60 years ago this week. 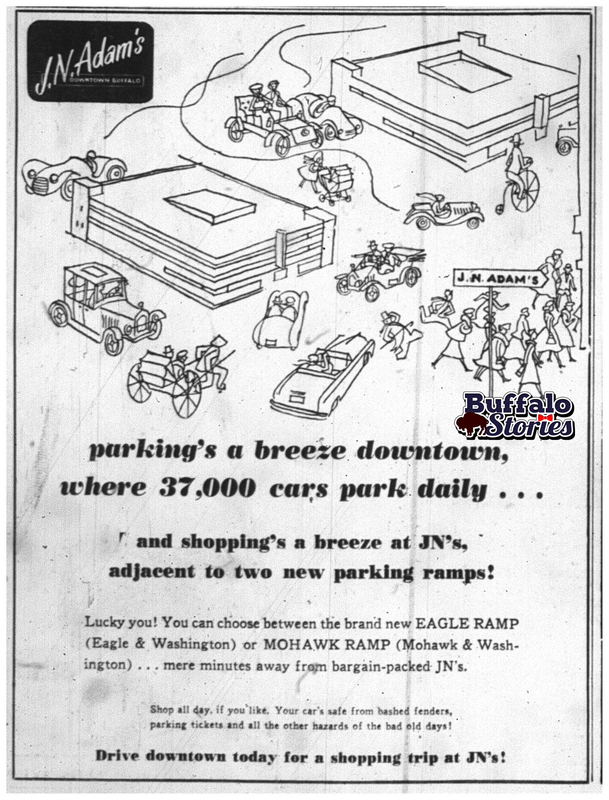 The Downtown Merchants’ big two page ad touts the pleasure of downtown shopping with two new ramps open with room for 37,000 cars daily. Many stores were running their own ads as well. 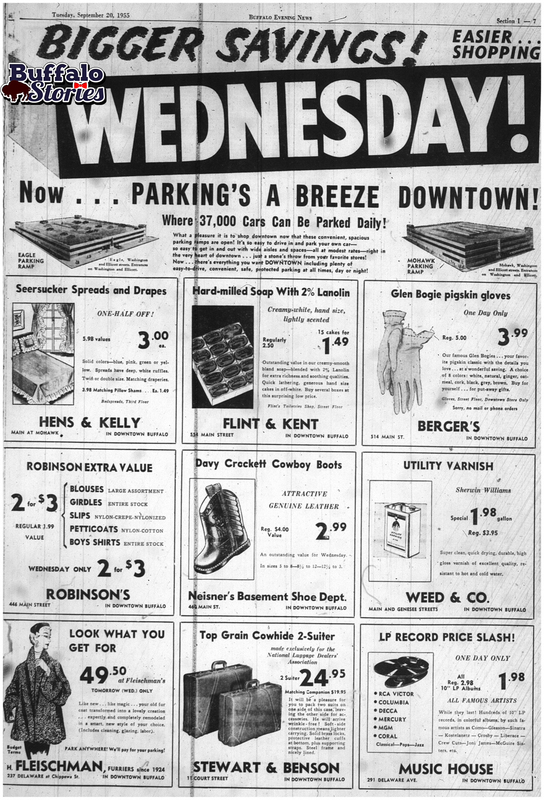 Kobacker’s, Hengerer’s, and JN Adam’s all paid to tell the people of Buffalo that “parking’s a breeze” at their downtown stores. All that parking didn’t help JN Adam’s. The store closed in 1960, and AM&A’s took over its location. The building with 37,000 parking spots only steps away was vacant for more than a decade. As reported by Jonathan D. Epstein in May 2015, the building is now being converted to a hotel catering to Chinese tourists.